Millions of the poorest households gain nothing from increases in the personal tax allowance. There is a competition at the top of the coalition as to who can claim the most credit for raising the income tax threshold to £10,000. The Tories cite “a tax cut for 24 million hardworking people” as one of the coalition’s signal achievements; and according to today’s Times, David Cameron’s next manifesto is likely to promise to raise the personal allowance threshold again to £12,500. Nick Clegg is also trying to expand what he (accurately) considers a flagship Lib Dem policy, and wants to raise the threshold to £10,500 from 2015. The coalition and their cheerleaders in the press are predictably keen on tax cuts, and are painting the raising of the tax threshold as progressive and a boon for feted ‘hardworking people’. Millions of Britain’s hard-pressed taxpayers will find themselves up to £705 better off after the coalition today delivered on its flagship tax cut a year early. There are several problems with simply raising the tax threshold, however. 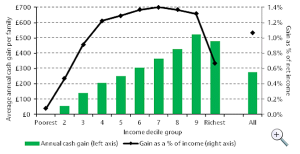 Firstly, the greatest percentage change in net income from the personal tax free allowance of £10,000 is seen by those on the upper end of the income scale – not, as is often claimed, low earners. The important line is the purple one, which accounts for the policy as proposed by George Osborne. The blue line represents the Liberal Democrat’s original proposal which Osborne has adopted without the corresponding adjustment of the higher rate threshold. This more recent graph from the Institute for Fiscal studies makes the same point. 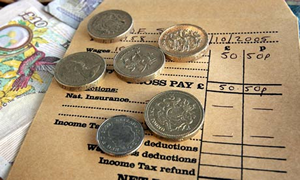 Analysis carried out for Left Foot Forward in 2010 also found that some three million households in the poorest quarter of the household income distribution would gain nothing from raising the personal allowance to £10,000. 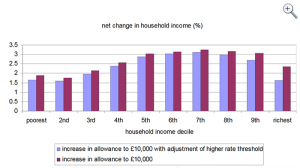 Increasing the personal allowance also serves to increase the gap between the bottom and the middle, resulting in low income households falling behind relative to the middle. The reason it benefits those on the right of the graph more than it does those on the left is because a raise in the personal tax allowance cuts income tax for everyone that earns enough to pay it since all benefit from a higher tax threshold. Those who don’t pay income tax – low earners, the disabled, those in retirement, the unemployed – gain nothing. When I asked the Treasury last year how much it would cost to raise the personal tax allowance to £10,000, it estimated the cost at £30 billion. Of this, only about £2 billion was spent on people who are taken out of tax altogether and it is worth least to people on low incomes who don’t get the full value of the policy…My conclusion is that we should both reform our tax system and help poor people. But these are different problems requiring different solutions (The Times, 23 June 2005). In contrast, cutting the rate of VAT from 20 per cent to 17.5 per cent would cost the exchequer about £12bn, but would boost the economy by about £4bn, according to the Office for Budget Responsibility. It would also benefit everyone, especially the poorest, who pay a greater proportion of their income in VAT. We did this before, tax cuts are not designed to help those on benefits in the lower decile. That is a feature not a bug. Make work pay, not pay people not to work. If you want to tax people on minimum wage and campaign for a living wage you need to have a re-think. Because that is beyond self-defeatingly stupid. Around a quarter of adults live in households where nobody earns enough to pay tax. They aren’t all “shirkers”, you know. One other affecting issue is Universal Credit- the Welfare Reform Act causes benefit payments rolled into it to be calculated post-tax rather than pre-tax, meaning that as the tax burden on the low paid is lifted, what they receive in benefit is decreased by the same amount they gain from. This has been done quite obviously deliberately because income-based benefits like JSA and WTC have always been calculated without regard to income tax. It means that now politicians can make extraordinary tax cutting promises to the low paid, which don’t benefit them, are cost-neutral to the government, but make headlines and bamboozle people into thinking they’re getting something out of this policy. I’ve tried getting journalists to pay attention to this, along with the extraordinary powers the Secretary of State has granted himself to dictate eligibility(Universal Credit is the first benefit of it’s kind, where entitlement is not statutory). Unfortunately, however, there is a point to what Guido says beyond his hatred of the poor. The best way to fulfil right-wing rhetoric on “making work pay” is to raise the incomes of the working poor. I think even most Labour voters would agree with the general sentiment that those who work should be better off than those that don’t (with the usual caveats, etc.). The answer is, of course, to BOTH raise the tax allowance AND the minimum wage well above what they are now. Benefits are already as low as they can get without being inhumane, and since this supposed gap is what is stopping people working, this solves that problem. I have a feeling the Tories won’t be voting for those things any time soon.